Courtside fans in Toronto and Portland are biting their tongues now. Apparently all LeBron James needs to be successful in the 4th quarter of a tight game is some motivation from some heckling courtside fans. In the first crazy instance in Toronto on January 6th LeBron scored 24 points in the 4th quarter after the girlfriend and cousin of Toronto Raptors Center Chris Bosh began heckling LeBron because of his poor first half shooting. Apparently the memo didn’t reach Portland, where last night a rowdy fan was apparently the reason for LeBron’s explosion in the 4th quarter as well. The heckling prompted LeBron to drop 17 points in the final 12 minutes, including 3 critical three’s in the final minutes and the eventual game winning shot. News like this can only tell us one thing. LeBron has gotten much better in the clutch and is starting to be more relied upon as a player that can actually finish. Not only that, but he is taking over games, he is taking over quarters and he is demanding the ball in crucial situations. This is not the same LeBron that passed up potential game winning shot attempts in the playoffs last year. LeBron’s offensive aggressiveness has increased and he is averaging nearly 3 more points per game than he did last year. The ability to produce in the final minutes of a game is the element of LeBron’s game that has been lacking in recent years and that has prevented him from reaching the level of Kobe Bryant (who God knows will be yelling in the huddle if the final play isn’t drawn up for him). If you like what you are reading, subscribe to The Trading Block’s RSS Feed! By now, you’ve probably heard that C-Webb is heading back to Golden State. But the 16 year NBA veteran and 5-time NBA All-Star isn’t just coming back to teach the youngins how to box out, he’s hungry to win and there’s a good chance he will be productive in Don Nelson’s high-tempo transition offense (an offensive style C-Webb has called “fun“). Rebounding: Historically, Chris Webber has been a beast on the boards. Averaging just under 10 rebounds for his career, Webber was the NBA rebounding champion at 13 boards a contest in his first season with the Kings in the strike-shortened 1998-1999 season. Passing: Heralded as one of the best passing big men of the 1990s, Webber averaged around 5 assists a game during his prime in Sacramento. He has soft hands and is a very intelligent high post player. Shooting: Webber has always shot the ball at a very high percentage. Although his FG% has declined since his days in Sacramento, Webber showed in Detroit that he can knock down the open shot with finesse when needed. His FT% has always left something to be desired, however. Hovering around 65% for his career, this is one of Webber’s liabilities. Defense: Webber has always been very active on the defense side of the ball. Knee injuries have definitely hampered his production in steals and blocks over the years, but there’s no debating that when healthy he should be producing at least a steal and a block a game on average. If Nellie preaches anything, it’s offense. Ranked #2 in the NBA in total offense at 109.2 ppg and worst in the NBA in total defense at 107.3 ppg, Chris Webber definitely has the potential to score a lot of points at a high percentage and probably pull down quite a few boards as well. In fact, if Chris Webber is as healthy as he claims to be, he figures to get pretty decent minutes as the only big men (if you can call them that) ahead of him on the depth chart at the 4 and the 5 are Andris Biedrens (10 pts, 10 rbs), Al Harrington (15 pts, 5 rbs) and Matt Barnes (8 pts, 5 rbs). Currently the Warriors are conceding 5 more boards to their opponents each night (due to their rapid fire offense) and a strong, experienced front-court player such as Webber would do well to control the interior. Also, C-Webb isn’t that old–at 34 years of age Hakeem Olajuwon was still averaging 19 ppg for the Rockets, Michael Jordan 30 for the Bulls and Karl Malone 27 for the Jazz. If C-Webb can do what I’ve predicted above, he should just be sneaking onto the list of the Top 100 Fantasy Players (and into the Top 25 Fantasy PF’s as well). In the ideal situation, a manager will patiently wait and see if Webber performs and then pick him up. But because many managers will use Webber’s name as reason alone for picking him up, I’d recommend picking him up when he’s activated if your team is desperate for PF production. Otherwise, wait it out if you can. Since most teams have moved past the halfway point in their season and All-Star starters have just been selected, it seems appropriate to figure out which pickups could provide the most dividends in the second half. Generally, these are young players on losing teams who will gain playing time when management decides to see what they have for next season. It may be wise to keep your eye on these guys for the time being. Randy Foye, Minnesota Timberwolves – He has fought an injury to his left knee all season, but all signs are that he should be ready to practice and will return around the time of the All-Star Break. A quick, slashing scorer (traded for Brandon Roy on Draft Day 2006), Foye has all of the talent to take the starting point guard job in Minnesota and provide help in points, 3-pointers, FT%, and assists. He is currently owned in 63.6% of leagues. Marcus Williams, New Jersey Nets – I have a gut feeling this is the year that the New Jersey Nets finally blow up this team and trade Jason Kidd for an array of young players and draft picks. In that case, Williams would rise up to be the starting point guard for the Nets and, judging from the talent and leadership he showed at UConn, provide assistance in points, assists, 3-pointers, and FT%. And with increased playing time, Williams may just answer the bell and become a top 15 point guard in the league, ultimately paying off for owners who read this advice. He is currently owned in 0.0% of leagues. Charlie Villanueva, Milwaukee Bucks – With talent that is hard to ignore, Villanueva entered this season as a sleeper pick, but has failed to produce. Although I find it stupid to keep backing a player who fails to blossom, Villanueva has shown spurts this season, and, with the Bucks again dwelling in the cellar of their division, should gain playing time alongside with star Michael Redd and former first-round picks Yi Jianlian and Andrew Bogut. He can offer a boost in points, rebounds, and even 3-pointers and FT%. He is currently owned in 10.6% of leagues. Thabo Sefolosha, Chicago Bulls – With a season-long injury nagging star Luol Deng, the inconsistency of Kirk Hinrich (before his recent outbursts), and the desire of management to play a big shooting guard for better match-ups, Sefolosha has garnered much more playing time recently, a trend that should continue. Although not a refined shooter, Sefolosha will help with points, rebounds, and both defensive categories. He is currently owned in 10.9% of leagues. Anderson Varejao, Cleveland Cavaliers – Although he just recently sustained an ankle injury, Varejao has returned from his contract dispute and quietly emerged as the force of energy that helped propel the Cavs to the NBA Finals last year. He is an excellent source of rebounds (currently leads the team) and FG% and does not turn the ball over. Furthermore, with a lackluster Cleveland frontline of the oft-injured Zydrunas Ilgauskas and inconsistent Drew Gooden, Varejao should see increased minutes and production. He is currently owned in 32.1% of leagues. We’ve talked a lot about what you should do in your fantasy basketball league, but what are some things you should avoid doing? You should never buy high or sell low on players. Unless there is an injury problem, players drafted within the first few rounds will generally come around to produce about their career averages (with only a few exceptions). Do not draft rookies too high; they generally underachieve and the upside gain is never worth the struggles that they face the first year (for an example, look at the top 10 picks in this past year’s draft). Try not to draft too many players from one team (especially if this is just your favorite team). There are never enough touches to warrant having 4-5 players on an actual NBA team on your fantasy team (the Phoenix Suns are attempting to disprove this). Also, there will be large fluctuations for these players. When the team is playing well, generally a few of these players will be doing well. However, when the team is losing, generally all of these players will be doing poorly. In Roto leagues, you may be able to sustain this. In H2H leagues, you probably will not. Also, if it is your favorite team, you will not want to drop players and will hold them for too long. Never ignore certain players on teams just because they are losing. All teams will have at least 1 player who is very fantasy worthy. See Al Jefferson, Minnesota Timberwolves. As hard as it is for a fantasy manager, he or she should not overemphasize the short run. The beauty of fantasy basketball is that league standings are volatile and players are streaky. The key thing to remember is that if you’re doing everything else right (drafting well, picking up and dropping players that are either vastly improving or underperforming, following individual player news, etc. ), you should be in pretty good standing in your league. If for whatever reason you’re team is middle-of-the-pack (5—7th place in a 12 team league), you should not try to compensate for this by making a hasty transaction. Unless you have an amazing fantasy team, chances are you will be weak in a few of your league’s categories. This is okay in H2H leagues. Generally, a manager should not try to overstretch his or her team in a H2H league by trying to do well across all categories. The beauty of H2H leagues is that once you get into the playoffs, a win is a win, whether it is 9-0-0, 5-4-0 or even 2-1-6. Focus on your strengths, accentuate those and forgot about categories you may never win. I like to focus on 6 categories at minimum. In a Rotisserie league, however, consistency is the name of the game. A 1 (out of 12) in the turnovers category will hurt your team and low standing in %’s will hurt your team, as well. In a Rotisserie league, ensure from the start that you are not neglecting certain categories—it may be too difficult to recover in those categories later on in the season. Let’s be honest, each of us loves certain players and despises others (the same can be said about teams, as described in point #3). The personal emotions that we attach to a particular player or team should never influence our decision on whether to add, drop or continue on with a certain player. Drop your favorite player if he is sucking. For the next installment of RookieWatch 07-08, we will take an in-depth fantasy look at picks #6-10. For fantasy analysis of picks #1-5, click here. Yi Jianlian, Milwaukee Bucks – A relatively unknown Chinese (hell ya!) seven-footer, scouts did not know if he would be the next Yao Ming or another version of Wang Zhi Zhi. And even though the Bucks knew that Yi would be unhappy in Milwaukee (no Asian population and really, really cold), they took him with the 6th pick anyways. It seems like a good decision. And it has been a welcome delight to fantasy owners who were patient and scooped him up off waivers. Scoring nearly double digits a game and a helpful resource in terms of blocks, FT %, and rebounds, Yi has become a valuable contributor as another option behind Michael Redd. It also helps that part of his contract promised him a good amount of playing time (he’s averaging over 27 minutes/game). Recommendation: If you need a source of blocks, FT%, or rebounds, consider trading a player with a reduced role such as Tayshaun Prince or David Lee. Corey Brewer, Minnesota Timberwolves – A two-time national champion with the Florida Gators, Brewer was touted as a tenacious defender with slasher ability in the Scottie Pippen mold. However, he has struggled for consistency on a young and terrible Timberwolves team. His scoring and rebounds have fluctuated from below average to terrible and that is the part of his game that has any positive value at all. A long defender, he has been unable to contribute in steals and blocks, and although he may still develop into a solid NBA player in the next few years, he has no place on anyone’s fantasy roster this year. Recommendation: Ignore and hope he makes strides in the offseason to become a sleeper pick in next year’s draft. Brandan Wright, Golden State Warriors – Another long, lean athlete, but without the credentials of Corey Brewer, Wright has struggled to find playing time and any type of stability in his first year. Wright is a raw athlete that probably left North Carolina much too soon, and he has struggled with his shooting stroke and has not picked up any time in the normal Warriors rotation. Although Golden State is generally a team that can increase the fantasy stats of players through its quick playing style, Wright has no value unless you get points for time spent sitting next to a very old coach. Recommendation: Do not even think about picking him up. Not even next year. Should have stayed in school but instead will follow the path of guys like Kwame Brown. Joakim Noah, Chicago Bulls – Although seen as the consummate team player while at Florida, Noah has been a nuisance in the Chicago locker room in his first season (but he is only one of the reasons that my Bulls have horribly underachieved). He was even suspended for a game by his teammates, which is completely unheard of. However, he does bring energy and, even though his shooting touch is awful at best, has garnered more playing time now that the Bulls are all but ready to pack it in for the season (even though they are unbelievably only a game out of a playoff spot in the putrid Eastern Conference). Check out his game against Indiana last week (14 points, 15 rebounds, 6-9 from the field, 2-2 from the line, 1 assist, 3 steals). Still, he probably should not garner any interest in your league. Unless we’re talking about a crazy dancing league. Recommendation: If the Bulls really start to tank, think about taking a flyer on him if the Baby Bulls (I think now its 4th generation Baby Bulls) get more playing time. Spencer Hawes, Sacramento Kings – Even playing on an injury-depleted team such as Sacramento, Hawes has not seen much playing time this year for the simple fact that the guy in front him, Brad Miller, has amazingly stayed healthy. Hawes showed some ability as a freshman at Washington, but he probably also came out too soon. I mean come on, even Stanford’s Robin Lopez has his number. He will most likely never develop into more than a Chris Mihm (and I wanted the Bulls to draft him, too) or Travis Knight (I always knew he sucked) clone, and thus should receive no attention in fantasy leagues due to sparse minutes and terrible peripherals. Recommendation: Ignore, even if he does get more playing time. Just seems like he is not NBA-ready. So as you can see, all of these picks, with the exception of Yi, have been busts for their teams so far. And with the exception of Corey Brewer, I think this trend will continue. I suppose the depth of this 2007 draft class was highly exaggerated. Coming up next, picks #11-15. If you’re looking for a strong up-and-coming PF, look no further–Ronny Turiaf is your man! 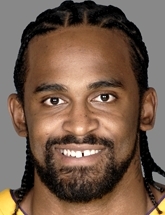 It goes without question that Ronny Turiaf is a great asset to the Los Angeles Lakers, but RT21 (as I have nicknamed him) has never been quite the fantasy producer. Admired for his energy, hardwork and relentlessness on the interior, Turiaf brings a much needed spark to the Lakers’ second unit now with Andrew Bynum sidelined with a knee injury. Another player that has sparked the Lakers second unit is Jordan Farmer, which I named the best free agent 3-point specialist pickup earlier today. As I write this post, the Lakers lead the San Antonio Spurs 54-45 at halftime and Turiaf has already accumulated 11 points (4/5 shooting), 4 rebounds, 2 steals, 2 blocks and an assist in only 12 minutes of play. In my opinion, Lakers Head Coach Phil Jackson will undoubtedly realize that Kwame Brown (booed off the court by his Lakers fans when he had 8 points and 7 turnovers) and Luke Walton (garbage!) are subpar performers and grant Turiaf more minutes. He is only averaging 17 minutes on the year, but I expect this to rise to around 25 minutes a contest (as it has the last couple of games). Also, we shouldn’t forget that Trevor Ariza is also out with an injury. I mean honestly, who else do the Lakers have on the interior that can produce? DJ Mbenga, who was signed to a 10-day contract recently? Pssh, the man can’t even say “taco“. The fact of the matter is that Ronny Turiaf is the only productive low-post player (if you can call him that) for the Lakers and I believe his fantasy stats (particulary his percentages, rebounds and blocks) will increase substantially in the next 7-8 weeks that Bynum is out. IF YOU NEED HELP IN %’s, RB’s and BLK’s, CONSIDER PICKING UP RT21. Here are 5 solid free agents that will knock down a lot of three’s. I have ranked the following players in the order that I believe they should be picked up in. Commentary: Farmar has been the epitome of consistency for the Los Angeles Lakers. Playing on average 20/min a game, Farmar still averages 10 points a game, a steal a game, and a few assists and rebounds a game. Due to the absence of Bynum in the middle and now Ariza on the wing, expect Farmar to get more minutes and more looks a game (especially from three-point land!). Anyone that has watched an LA Lakers game recently knows that Farmar leads the second unit in scoring, intensity and reliability. My favorite metric for measuring a Lakers player’s performance is whether Kobe Bryant passes that player the ball and this is definitely the case when you’re talking about Farmar. Commentary: “Baby Kobe”, as his teammate LaMarcus Aldridge so admiringly nicknamed him after he scored 24 points in one quarter, is a talented, but very streaky player. As of late, Webster hasn’t been doing so hot, so he probably will be available in one of your leagues. Watch out for this guy, though. He’s got a phenomenal shot and displays incredible athleticism. Although his shot has been a little off the past few games, managers that are seeking 3PT will be glad to hear that nearly everything he has put in the basket as of late has been a 3PT. Commentary: No longer in the starting lineup, Keith Bogans is one of the better 6th men in the NBA right now. His 3PT shooting percentage isn’t spectacular, but because of the sheer number of looks he gets, Bogans is a legitimate 3PT option for any manager looking to improve in this category. One of the good things about him coming off the bench is that his FG% has drastically improved; it looks as if his shot-selection has improved and this has yielded dividends for the 6-5 guard-forward out of Kentucky. Commentary: Eddie House is a very sold overall fantasy player with a particular prowess in 3PTM. Another good sign for managers is the fact that House has been getting more than 10 more minutes a game above his average the last 5 or so games. Not only can House knock down the three ball, but with additional minutes he can pull down a few rebounds, dish out a few dimes and make at least one steal a game. Commentary: At 34 years of age, Michael Finley is still a legitimate scoring threat on a very good Spurs team. Lately his minutes have been sporadic to say the least, and the Spurs have been having their individual team woes as well, but expect Finley to rebound strong in the second half and improve upon his very mediocre fantasy rank. This guy’s just too talented not to if he stays healthy.